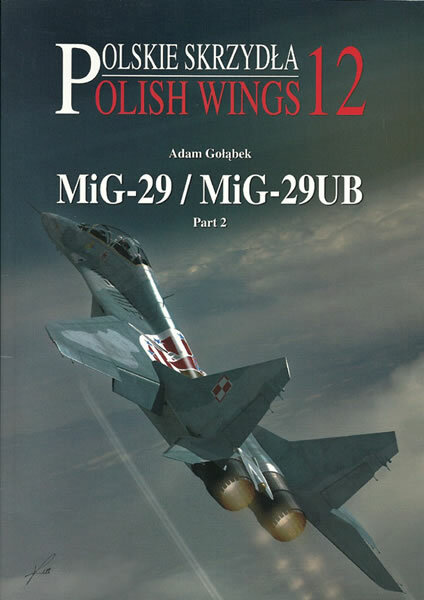 Following on from Part 1 of the MiG-29 books which covered the original MiG-29 fleet as purchased direct from Russia in the late 1980s, this volume in the Polish Wings series covers more recent events including the purchase from Germany of their surplus MiG-29G fleet in the early 2000s after rejecting a Russian offer for new generation upgraded aircraft. The first three pages cover the history of this purchase before turning to the subject aircraft in detail. Like Part 1 this book is clearly intended to be a reference of value to modellers. 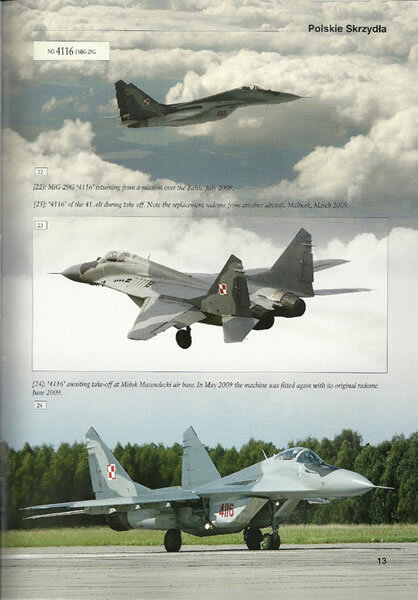 The majority of the book compromises comprehensive photo coverage of Polish MiG-29s, with a limited number of pages of text and tabulated data. The author has taken a logical approach of looking at each airframe in turn, with some photos and four views of them in their original German markings followed by a range of photos of the aircraft in Polish squadron service. It is an easy to follow method and contrasts greatly the relatively poor material condition of the German airframes prior to regeneration by the WZL-2 aircraft works and Polish Air Force Technical Institute. 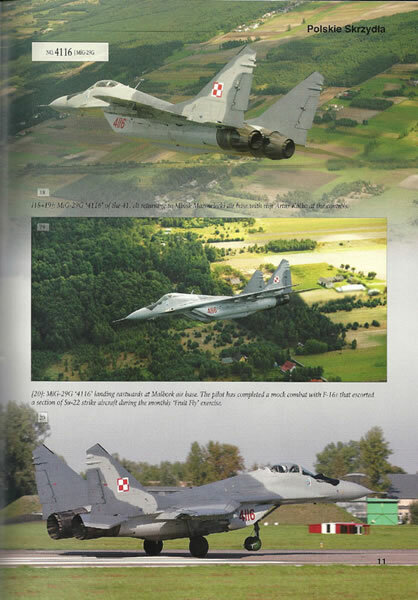 The second half of the book covers the operation of the MiG-29UB trainer and covers both Polish acquired, ex-Czech and ex-German airframes. 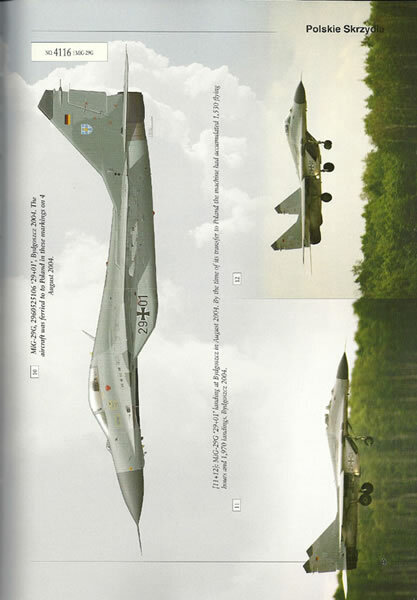 For both subjects (the German MiG-29Gs and all the MiG-29UBs) the majority of the photos are overall shots of airframes and serve to document camouflage and markings over the period of operations. These are supported by detailed colour four view and side profiles along with close up photos and drawings of the unique markings applied to the airframe along with a table of Federal Standard colour cross references. The final three pages provide some excellent large format colour shots of the cockpit area for the super detailers. 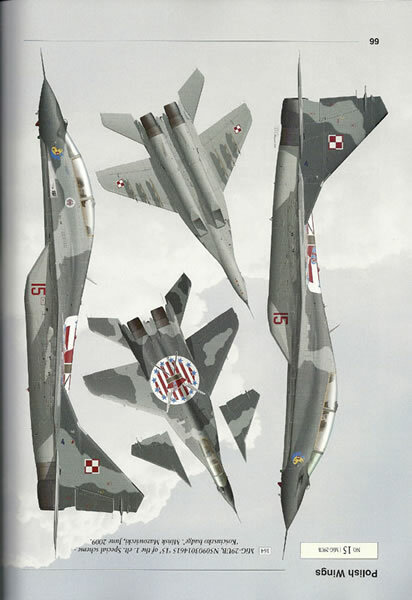 In conjunction with Part 11 of the Polish Wings series it appears that most MiG-29 aircraft that have seen Polish Air Force Service are represented in this book along with all the variations of colour schemes applied. 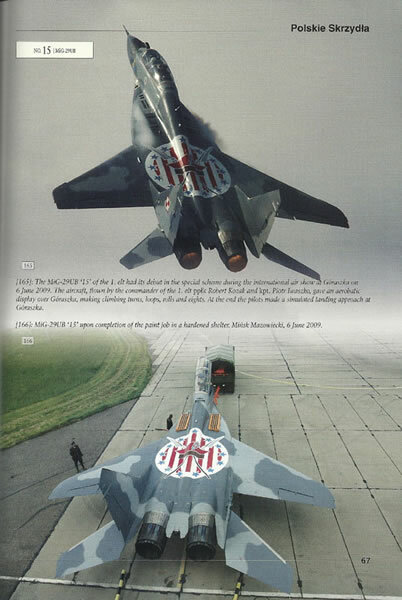 Whilst an extremely narrow subject, PAF MiG-29s carry some attractive schemes which alone makes the book worthwhile. Add the extra detail that can be extrapolated from the numerous photographs and this becomes an excellent reference for anyone wanting to model a MiG-29 Fulcrum. One final note for modellers, the Polish decal firm Techmod is cited inside the front cover as preparing decal sheets to cover Polish MiGs. A quick check of their website indicates they have yet to be released but it is a development worth monitoring if you want a Polish MiG-29 in your collection.